Grammy is in town and she let the grown ups out on a date night!! We rocked and rolled; we ate well, we drank better; we quickly caught a cold. We are so out of practice. Enter Faux Pho. Pho is a total cure-all in our house - spicy, gingery, brothy, clean... but you have to - oh-goodness-no - leave the house for it and sometimes that's a deal-breaker. I've started making this Faux Pho to fill the gap when we need the good stuff, but cant face getting out of our jammies. In a large pot, start the broth to simmer. Add chicken broth, fish sauce, soy sauce, half the green onion and minced ginger. In a frying pan over high heat (or wok if you're lucky enough to have one!) start chicken, celery and chili pepper. When the chicken is about half way cooked through, add the broccoli to the broth. I wanted it to cook through, but not be limp. About the same time, add the tofu to the chicken pan. 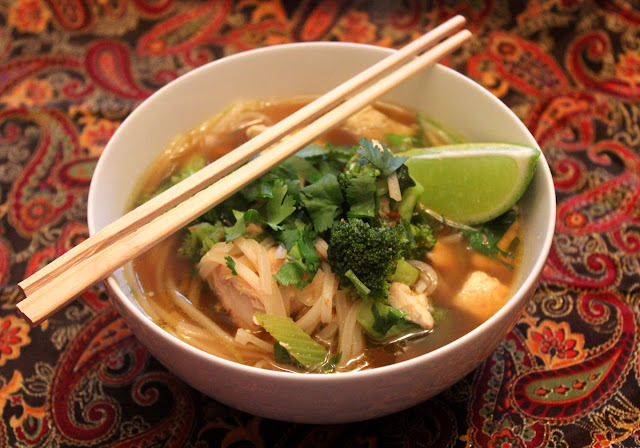 When the chicken is cooked through, add the cooked chicken, half of the cilantro and the rice noodles to the broth. Turn the simmering broth down even farther - just keep it hot. The rice noodle need to sit for at least 5 minutes in the hot broth. Test occasionally. Add bean spouts to four serving bowls and top with hot soup. Sprinkle on the remaining cilantro, green onions and garnish with lime slices. Add Sriracha if you like things spicy. We do! I don't always use tofu, but I think this soup would be good with just tofu and no chicken. Use vegetable broth in place of chicken broth for a meat-free meal. Rice noodles can get gummy. I think whole-wheat spaghetti noodles cooked and rinsed would be delicious added to this soup.